Breckenridge and Summit County offer endless options for fun. 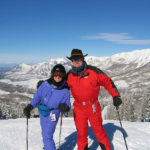 Winter activities include skiing, boarding, cross country skiing, sledding, snowmobiling, ice skating, sleigh riding, dog sledding, and breathing in the fresh air. Summer activities include hiking, biking, fishing, sailing, golfing, river rafting, horseback riding, tennis, camping, four-wheeling, and alpine sliding. You can also tour a gold mine, visit the human maze, take nature classes, go to art fairs, listen to the National Repertory Orchestra, buy fresh food and vegetables at the farm market, eat delicious food on a restaurant patio, and smell the many beautiful flowers. Theatre and other cultural events are also presented year around. The Breckenridge Recreation Center offers a fitness center, swimming, a rock climbing wall, and various other activities and classes for the entire family. And if all this is not enough, there is a wonderful puzzle store in town, a quilt shop, an Internet café, and DVD/video rental stores.